MY THOUGHTS: This is a really good book. It is also the first of a trilogy. Can’t wait for the next book. To find out what Darkus gets into. Darkus finds a beetle, or does the beetle find Darkus? This beetle is very smart and understands Darkus when he talks to him. Darkus and his friends find a large beetle colony living in the neighbors house. And all the beetles understand them. Darkus and his friends are determined to save the beetles. They come up with a plan to save the beetles. And Darkus finds his father and has to rescue him from the woman who is going to exterminate the beetles. Does Darkus free his dad? Do the beetles get exterminated? Read the book, it’s really good. I give this book 5…. This book is for 2 of my reading challenges…..
On the verge of resigning from the D.C. police force, Detective Alex Cross knows he can’t refuse this case. His partner John Sampson has a friend who has been framed for murder and is facing the gas chamber. His accusers? The United States Army. As a new woman in Cross’s life brings him hope in the face of a devastating loss at home, Cross and Sampson go up against codes of honor and silence and three ruthless killers. But a bigger threat lies in wait: Their controller, a lethal genius who will introduce Cross to new depths of terror . . the last of the FOUR BLIND MICE. MY THOUGHTS: This is book 8 of the Alex Cross series. It is just as good as the first. Keeps you glued to the book to find out what’ s going on. Alex and John have to find the people targeting soldiers. They set the soldiers up for murder and the soldiers get the death penalty. But the army is very secretive about this. They don’t want to share info with Alex. So Alex calls on a friend at the FBI for help. They finally track the assassins down, but who’s behind these men for hire? Alex has to find out. I give this book 5…. This book is for 2 of my reading challenges…. I’m so far behind on everything….books, quilts, embroidery and the creative challenge I’ve been working on. I didn’t get my circles done for August, my Guinnie Inspired quilt didn’t get done and my embroidery is sadly lacking and stitches. My creative side has taken a vacation, can’t seem to get the juices going again. Haven’t been reading much either. I’ve been reading the same book for over a week, which is a long time for me. So I’m hoping September will be a better productive month. Hope everyone has a wonderful LABOR DAY weekend! I finally got my Gwennie Inspired quilt done. For the month of August the theme was STARS. I just used a border of stars. The theme for September is “Something Fishy”. I’ve got an idea, just have to figure out how to use it. Hop over to Humble Quilts for a look at everyone’s quilts. Andy Carpenter isn’t sure what to think when he gets a mysterious phone call from a good friend, policeman Pete Stanton, asking him to drop everything, drive to an unfamiliar address, and bring his girlfriend, Laurie Collins. He certainly isn’t expecting to show up at a crime scene. But that’s exactly where he arrives-at the house where Pete has just discovered the body of ex-convict Danny Diaz. Upstairs are Danny’s now orphaned eight-year-old son and basset hound. And that, Andy discovers, is why he and Laurie were called to the scene-Pete wants them to take care of the boy and the dog so they won’t get thrown into the “system.” This is already asking a lot, but soon Pete needs another big favor from Andy. Pete himself has come under suspicion for Danny’s murder, and he needs defense attorney Andy to represent him…and to find out what really happened in Danny’s house that day. MY THOUGHTS: This is the 3rd book I’ve read of this series. And they were all out of order. But they are great stand alone books. One of Andy’s best friends is under arrest for murder. It’s Andy’s job to defend him. So he puts the team into action. As they come across some mysterious deaths, they start to see a pattern and it all links back to who killed Danny Diaz, and it isn’t Pete. The only thing is all the witnesses for the defense keep coming up missing or killed. You will never figure out who the actual person is that’s behind all this. I didn’t, I was totally thrown off on this one. I give this book 5….. This is also my wrap up for What An Animal reading challenge. Here are the books I read….. This book is also for 52 Books in 52 Weeks Challenge. MY THOUGHTS: This is my book club choice for August. I’m not really too fond of reading books on sports, but this book is more than sports. It’s about two boys, one white, one black that become friends during a time when this was unheard of. The one thing that connects them is basketball. Eddie and Bill eventually grow apart, but the friendship is still there. It is shown at the Finals of the 1970 season. Eddie’s school, all white, Gallatin High and Bill’s school, all black Union High have to face each other in the finals. What will become of the town if the black school wins? What will happen if the white school wins? I’m not telling…..you have to read the book to find out. I give this book 5….. This book is for 1 of my reading challenges…. WHAT I’VE BEEN WORKING ON…..
I’ve been working on my circles of course. I’m on day 213 of making these circles. I’ve got the July circles done…well I thought I did. I counted and I’m one short. So have to finish that one up and on to August. You can check out all the circles over at Quilty Folk. I also used colors for the RSC, what is this you might ask. Rainbow Scrap Challenge, the idea is to use up all your scraps. For the month of July, the colors were Hot Pink with pink, red and green added in. The colors for August are Purples with Greens. I’ve started putting my circles together, I’ve got January and February all done. I’m working on March now. I think I’m going with 3 months across for my width, the length will be the rest of the year. I’m also going to change the smiley faces. I’m going to use a yellow or green smiley face for April, May and June. I’ve also been working on my Gwinnie Medallion quilt. You can check out the info over at Humble Quilts. The choice for July was Log Cabin. Weeeeellllll, I don’t piece blocks, I do needle turn applique, so had to get a little inventive on this one. So I done Lincoln Logs in place of Log Cabin. The next border for August is Stars. So I’ll have to figure out what to do with that one. It has to be applique. I’ll have to surf the web for a star. You may notice it’s a little wrinkled, my iron decided to quit on me, so have to buy a new one. Hoping to get one tomorrow while I’m out and about. So what has everyone else been working on? I’m joining in for Friday Hunt, over at Eden Hills….. the words this week are Starts with G, Weeks Favorite and Wheels. Hop over and check out all the photos everyone is sharing. Miss Bella likes to wear her bunny rabbit hat, more to play in than to wear for the cold. But really, 90 degrees and 100% humidity is just a little tooooo much. Even though we haven’t had any significant amounts of rain in the last 20 days, our grass is still green. A few brown spots are showing up. Bella and Luke playing and Bob is watching. Lots of wheels, the little car the twins are playing with has wheels. My Taurus has wheels. We have a corner in our yard that has grown up “wild”. Lots of plants and “critters” live here. It’s like it’s own Eco-system. I’ll try and name a few of the plants here, but don’t know all of them. Climbing the wall is Honeysuckle and Trumpet Vines. There is also some Wild Poke to the left. It has fallen down, but there is still a small piece there. They are done right done, but some lilies and daffodils are in here also. The little bird house has nesting English Sparrows. They raise their babies and they fly away. As for the trees in the background, they are mostly maple trees, with the exception of the Blue Spruce. It is over 60 ft. tall and still growing. But it is getting a little raggedy with age. Here’s another view…. This window is our living room. When your sitting there you can see everything going on in this Wild Place. Did I mention there are squirrels and chipmunks roaming around here? I haven’t seen any, but I’m almost sure there are some bunnies living in here. 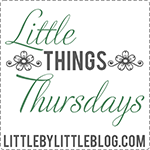 I’m linking up with Kim over at Little by Little. Hop over and take a peek at Kim’s place. What the heck is this? Well, for people that stitch, it’s the trimmings of fabric, thread ends, yarn ends and whatever else is left from stitching, quilts, embroidery, cross stitching, knitting, crocheting, well you get the idea. Daffycat is the host for the Totally Useless Stitch a long. Once a month we share all our snips of leftovers. As usual, I’ve forgot to do mine. So I’m doing mine now. This is a 3 month TUSAL. May, June and July…..
A blog by any other name?